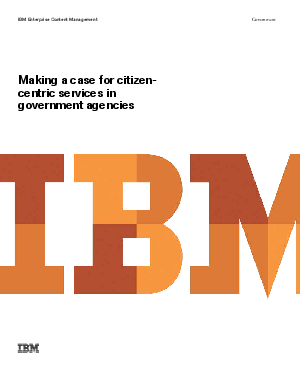 As the economy starts to recover, government agencies are under increased pressure to streamline their processes, reduce costs, and improve citizen services with fewer and fewer resources. With change as the driver, government agencies of all sizes are charged with balancing needs with greater demand and complexity to keep government moving. innovative ways to minimize bureaucracy while providing better service and faster outcomes. To satisfy these demands, there is a need to provide a viable platform to deal with the multiple tools and processes—as well as the thousands of documents, files, and related content created from emails and other electronic transactions that are pervasive in government. Although great strides have been made to automate most services, government agencies remain burdened with processes that require high levels of manual intervention that, in turn, can lead to operational inefficiencies. Many of these processes are supported with different systems creating complex and redundant solutions that are costly to maintain and manage. This complexity, coupled with limited budgets and resources, the pressure of public scrutiny, and the need for transparency, creates unique challenges for today’s government.